Customizable, durable wristbands with an extra-large surface area to show off your design. Looking for a wristband with a wider surface area? MyZone Canada custom wide plastic wristbands are perfect for large customization with an expanded printable area of 1 inch (25mm) x 2 1/3 inches (6cm). Made from durable, water and stretch resistant plastic, these wristbands are great for extended wear, and a secure, cost-effective admissions solution. MyZone’s custom wide plastic wristbands are available in a wide range of colors and metallic finishes. These bands also come complete with a secure plastic locking snap which effectively protects against tampering and re-use. 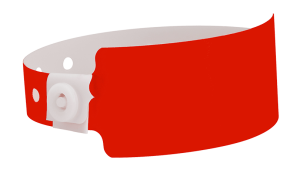 Plastic wristbands can be customized with your logo, graphics and/or custom text. We also have optional advanced wristband security features to help prevent fraud at your event admission or party. Looking for standard size plastic wristbands? We also stock standard sized custom plastic wristbands! Buy plastic stock wristbands and have them shipped within 24 hours of your order (excluding weekends). Custom wide plastic bands will be shipped from our company factory within 8 days of receiving your proof approval. Shipping can be done to anywhere in Canada!